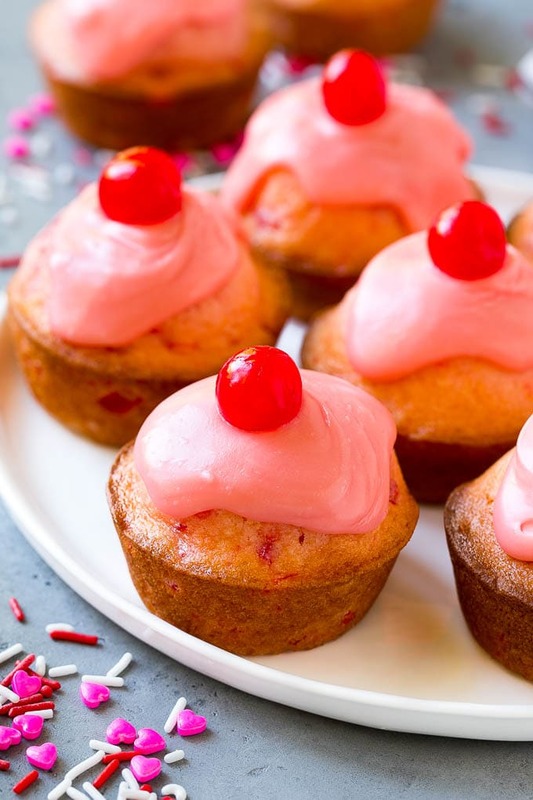 These bright pink cherry muffins are studded with maraschino cherries and topped with both a cherry glaze and a whole cherry. A fun and festive treat that’s perfect for parties, snack time or just for when you have a hankering for something sweet. If you’re a maraschino cherry fan, you will adore these cherry muffins. Each muffin is moist, tender and chock full of cherries! 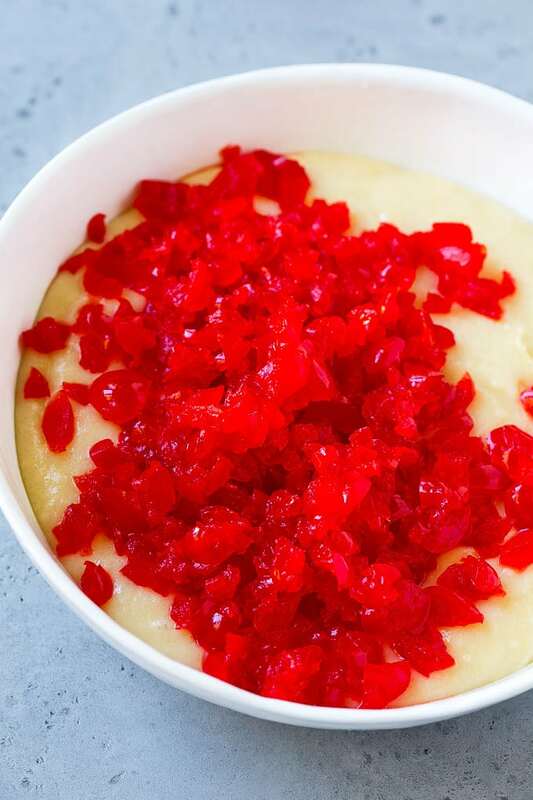 I find that people typically have a strong preference when it comes to maraschino cherries. You either love them or you hate them! 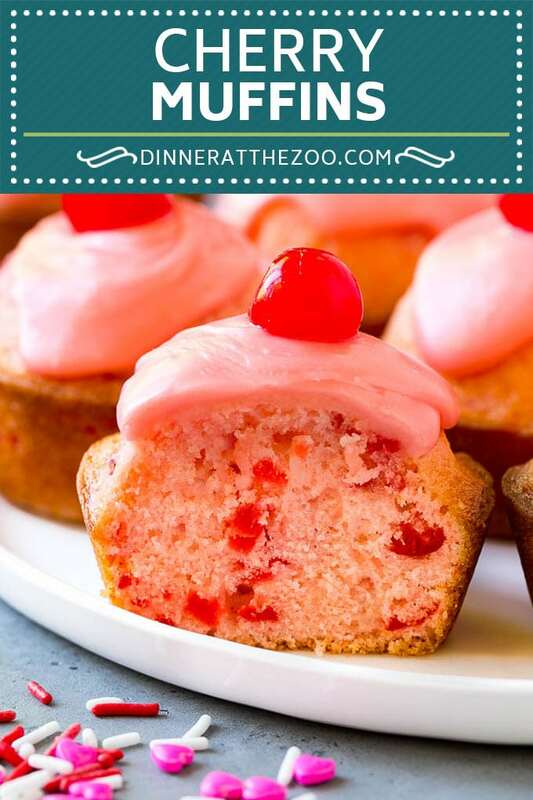 I’m in the love category, so these pretty pink maraschino cherry muffins are a dream come true for me. They’re so bright and festive for any celebration, and your kids will be thrilled to come home to them for an after school snack. 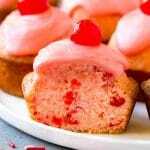 How do you make cherry muffins? This is a pretty basic muffin batter with flour, sugar, eggs and oil. 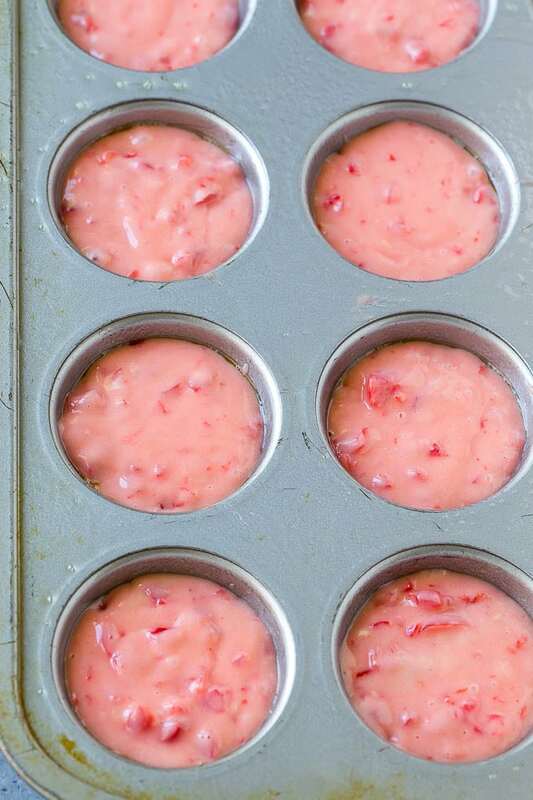 A bunch of chopped maraschino cherries get folded into the batter, along with some cherry juice to give the muffins their pink hue. The muffin batter gets evenly spooned into a muffin tin and then baked until light golden brown. 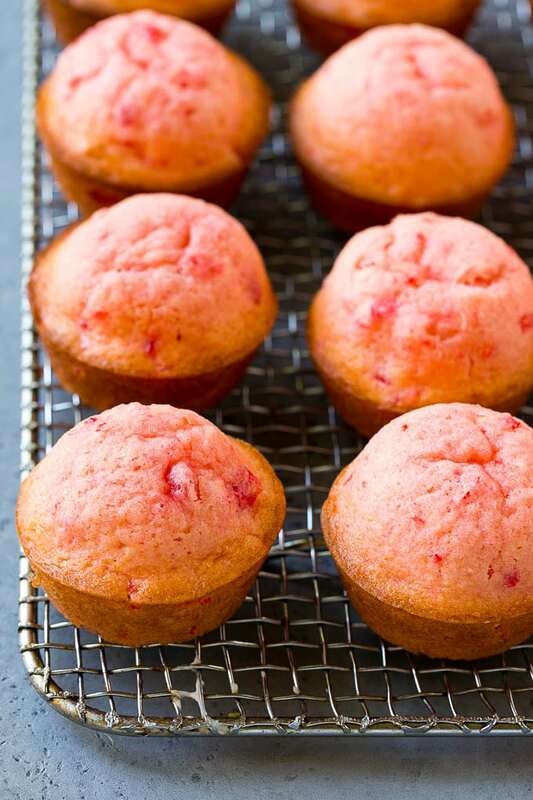 You can either serve the muffins as-is, or add a pink cherry glaze. I’ve made them both ways and you can’t go wrong even if you choose to skip the glaze. The glaze really does take these muffins over the top, and is a simple mixture of butter, powdered sugar and cherry juice. You can make the glaze as thick or as thin as you like, just add more cherry juice to thin it out, or more powdered sugar to thicken it back up. The finishing touch on these cherry muffins is a cherry on top! You could also add a few sprinkles and serve these at a birthday party for an unexpected treat. You can freeze these cherry muffins, but I’d recommend that you hold off on adding the glaze if you’re planning to freeze them. You can add the glaze to the defrosted muffins right before serving. My kids are already asking for another batch of these cherry muffins, and I’m totally happy to oblige! 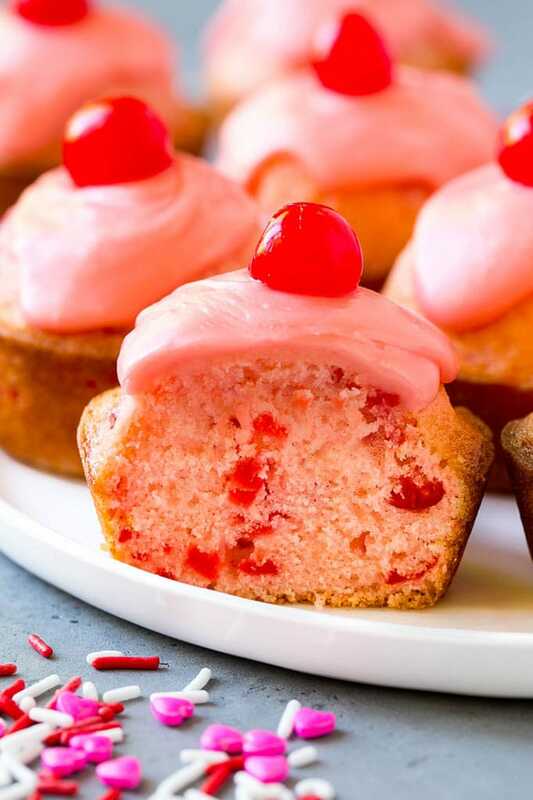 These bright pink cherry muffins are studded with maraschino cherries and topped with both a cherry glaze and a whole cherry. A fun and festive treat that's perfect for parties, snack time or just for when you have a hankering for something sweet. Preheat the oven to 400 degrees F. Coat a 12 cup muffin tin with cooking spray. Place the sugar, milk, vegetable oil, egg and vanilla extract in a large bowl. Whisk to combine. Add the flour and baking powder, then stir until just combined. Add the cherries and cherry juice to the bowl, then stir gently until well mixed. Spoon the batter evenly into the muffin tins. Bake for 12-14 minutes or until edges are just browned. Cool the muffins completely before adding the glaze. To make the glaze, whisk together the powdered sugar, butter and cherry juice until smooth. If you'd like a thinner glaze, add more cherry juice, 1 teaspoon at a time. If you prefer a thicker glaze, add more powdered sugar, 1 tablespoon at a time until desired consistency is reached. Spoon 2 teaspoons of glaze over each muffin then immediately top each muffin with a cherry. Let the glaze harden, then serve. 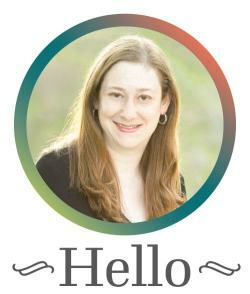 Adapted from Tastes of Lizzy T.
This post was originally published on July 14, 2015 and was updated on September 24, 2018 with new content. Oh goodness, these look amazing! My oldest daughter loves cherries and would have so much fun helping make these. Makes me drool for a moment. Definitely be trying this out. Its good to indulge for a moment and have some time to taste this awesome cherry muffins. Are these muffins or cupcakes? Either way, they are adorable and look so delicious. I love the look of them too! Bookmarking! My daughter would like this muffin, she love maraschino cherries. Glad you have shared the recipe, I will show this to her since she likes to bake. I love muffins but have somehow never had a cherry muffin?? How is this possible?? These cherry muffins look fantastic! !